At the end of last week’s session. some servos had to be added. These were connected to the panel by Ray and Shaun. Inevitably another missing servo was detected and this was also added in. Some time was taken to ensure that the computer records and the point nomenclature were aligned. Richard continued his sterling work on the pump house. There is a rumour starting to circulate that this new building is so magnificent that the wagon works will be sold and the buildings surrounding properties may have to be demolished to make way for a grander architectural project. 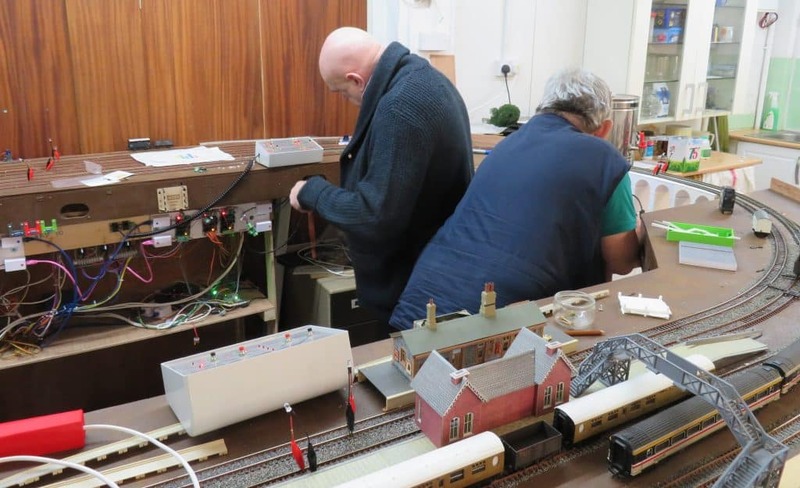 Some testing carried out on the mimic panel by Malcolm H and time was also spent trying to resolve a potential short circuit. Various loupes and magnifying glasses were used to little effect. Eventually the solder along two of the tracks was reflowed and the problem was resolved. After the work on the servos was completed, Allan spent time trying to resolve a track power issue. AFter much investigation the problem was tracked to two isolated sections in the station. In order to help track the problem some bi-colour leds were connected to crocodile clips via a one kilo ohm resistor. Connected on way the LED is red and connected the other way it shines blue. As it power is turned up, the LEDs shine more brightly. Eight of these devices were used to try and understand the problem better. The power switching between the outer loop and freight lines was reinstated, leaving just two isolated sections to be checked out in April.